Members of the KUGB will grade though the Kyu Grades from 9th Kyu down to 1st Kyu. Each grading will be based on specific Katas that they must learn in training and specific punches, kicks, blocks and stances. The reward/sign for passing each Kyu grades is a change in belt colour. 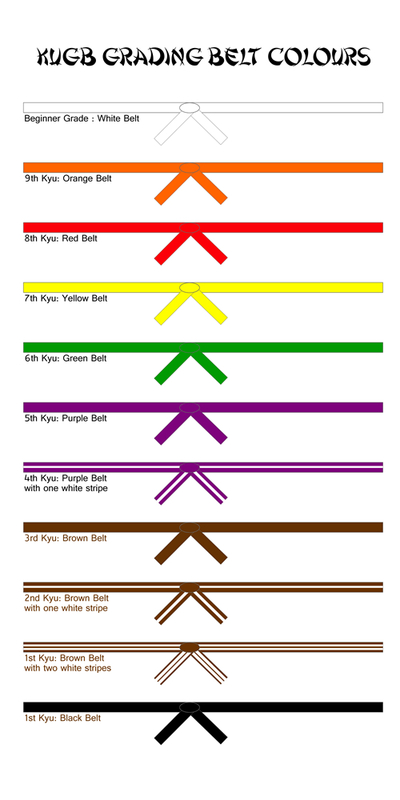 The belt order is White, Orange, Red, Yellow, Green, Purple, Purple with a single white stripe, Brown, Brown with a single white stipe, Brown with a double white stripe then the black belt. Only members holding a current KUGB licence and training at least twice per week at a KUGB dojo, with a KUGB Instructor, are entitled to grade. KUGB members will be eligible to grade providing they have fulfilled all technical requirements and have the permission of their club Instructor. Members who wish to grade outside their own club, must obtain permission in writing from their club Instructor. Novices may take a grading after two months of training. Future gradings up to 1st Kyu may be taken at minimum three monthly intervals. It is possible in exceptional circumstances for students to jump’ grades, but only up to 7th Kyu. Members who fail Kyu grades may re-grade after a further three months. A ‘Temporary indicates that a member is not quite up to the required standard, though they will be able to wear the same belt and train on the same syllabus as if they were a full grade. There are no age restrictions for Kyu gradings. The minimum period between 1st Kyu and 1st Dan is six months. Full 1st Kyu must be obtained before attempting 1st Dan. Those taking 3rd Dan or above should produce course attendance records. Members who fail Dan gradings must wait a minimum of three months, unless otherwise specified by the examiner. There are no age restrictions for grading up to 2nd Dan. The minimum age for attempting 3rd Dan is 21. Karateka transferring from other British Associations may wear their current belt, but must grade with the KUGB and be assessed for their KUGB standard, within a specified period. The grade of Shotokan Karateka from other countries will be accepted providing that the KUGB recognises and approves their Association.